After last year's controversial pick of Seth MacFarlane to host the ceremony, the powers-that-be decided to stick with the more reliably safe Ellen DeGeneres this time around. 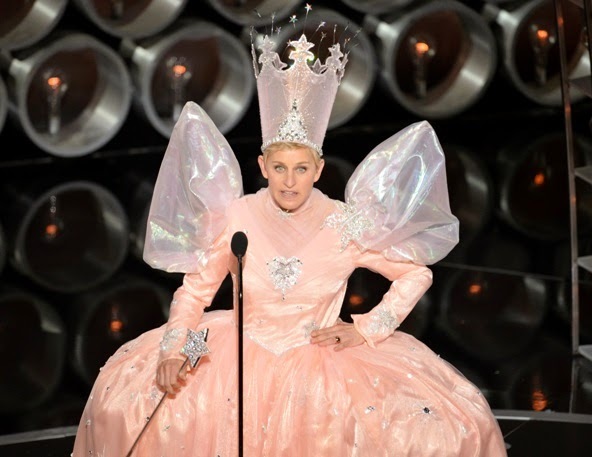 Ellen first attracted attention for her hosting capabilities when she turned in a very graceful and restrained performance as host of the 2001 Emmys, held just days after 9/11; she was first picked to host the Oscars in 2007 and was so popular that she's been invited back several times, becoming the most reliable host the ceremony has had since Billy Crystal. This year, she was on fire with a series of inspired comic moments that were among the most talked-about of the evening. First, she managed to comment on Jennifer Lawrence's comic fall on the red carpet; it was J.Law's second year in a row tripping over her dress, to which Ellen gently suggested that should she win an Oscar, maybe they should bring it to her this time around. This brand of inoffensive, but still amusing, humor rescued much of the tedium of the 3 1/2 hour broadcast. At one point, Ellen asked Meryl Streep to join her in a selfie. A dozen celebrities--including Brad Pitt, Julia Roberts, and Bradley Cooper--quickly tagged along to the shot, resulting in the most re-tweeted photo in Twitter history. Some commentators actually made more hay out of the fact that Liza Minelli tried to join in on the shot, but was too vertically challenged to be seen! 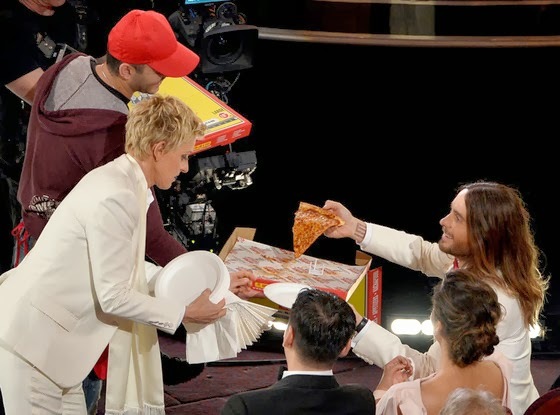 At another point, Ellen ordered pizza for everyone, passed it out among the celebrities in attendance (with Brad Pitt handing out plates), and then took a collection for the tip...with Sandra Bullock then pretending she had no funds to contribute. Such lighter moments were too few and far between, however, in a ceremony that was largely filled with the kind of tedious padding we've all come to expect over the years. Three-and-a-half hours is just too long for an awards broadcast, and there were far too many tributes and film montages that could have been cut or trimmed to fit the show within a more palatable three-hour time frame. At one point The Wizard Of Oz was given its own tribute, simply because it was the 75th anniversary of its release. Then, an otherwise-touching tribute to last year's recently deceased performers was unfortunately followed by Bette Midler performing a rather histrionic "Wind Beneath My Wings". This was just the kind of canned Oscar "moment" that could have easily been excised, although it did allow this author enough time for both a bathroom and snack break. The winners this year were largely predictable, with Gravity and 12 Years A Slave dominating the pack. 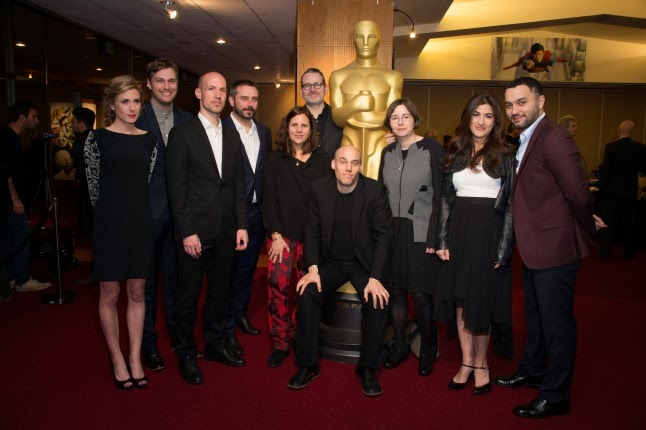 As usual, the Oscars picked a "message" film (12 Years) for best picture, although in an unusual twist, the best director award went to Alfonso Cuaron for Gravity (ordinarily, the same film almost always captures both Best Picture and Best Director honors). Jared Leto and Lupita Nyong'o won predictable but well-deserved awards for Best Supporting Actor and Actress, and each gave memorable speeches at the podium. Matthew McConaughey was another shoe-in for Best Actor, although there was some speculation about the Best Actress award. Cate Blanchett was the heavy favorite going in for her stunning performance in Blue Jasmine, until the unresolved molestation scandal involving director Woody Allen suddenly tainted the film. 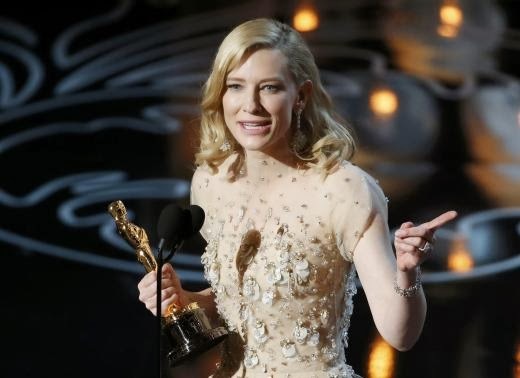 The Academy decided to give her the award anyway, which led to one unavoidable but awkward moment when Blanchett thanked the director in her speech. Some noted the irony of Will Smith presenting the award for Best Picture, when he had just won a Golden Raspberry award ("Razzie") the night before for Worst Supporting Actor in the sci-fi dud After Earth. Speaking of which, the film which won Worst Picture that night at the Raspberries was Movie 43, the star-studded sketch comedy fiasco which was roundly panned as not just the worst film of 2013, but one of the worst movies ever made. While the stars don't exactly take to the stage to accept their dubious honors at the Razzies, the ceremony has become a memorable antidote to the ego-filled pomp and circumstance of the Oscars themselves. Perhaps the most disappointing loss of this year's Oscars occurred in the Best Documentary category. While there was nothing wrong with winner 20 Feet From Stardom, the favorite going in was Jeremy Scahill's riveting Dirty Wars, a scathing indictment of the current US drone strike program. The subject matter was perhaps too controversial for an Academy still reeling from Michael Moore's infamous (or famous, depending on your point of view) "fictitious wars" speech at the 2003 Oscars, and so Scahill was shut out. This snub was perhaps indicative of the safer tone the Oscars tried to take this year: no more Seth MacFarlane's, no more Michael Moore's. Just give us a celeb-studded selfie to retweet and an extra slice of pizza, please!